Want to up the festive factor this Christmas? One easy, affordable and – may we say – beautiful way to do so is with winter plants and festive floral displays. Our experts, horticulturalist Matt James and floral designer Laura Lee tell us what to choose and how to care for them – plus how to make the biggest impact. 'Some of this country’s most beautiful trees and shrubs, such as Jasminum nudiflorum (winter jasmine), Viburnum farreri and Abeliophyllum (white forsythia), wait until mid-winter to flower. Plant these outside, then cut thin branches for decoration inside,' says Matt James. Find out how to plant a winter garden – and check out our list of the best plants for winter interest. 'Poinsettias, cyclamens and hyacinths grown for the Christmas period are usually forced into flower. Position them out of draughts, avoid deep shade and strong sunlight, and keep them damp – but not wet – particularly indoor azaleas. Regular feeding while in flower will also prevent wilting. Fragrant stephanotis and gardenias won’t mind warmer rooms, but mist them daily. For house plant care tips, see our feature – and find out how to display house plants for maximum impact, too. 'Look out for neutral twigs, branches and vines that can be found easily in the winter season. They’re ideal as they don’t need to be kept in water so you can get creative!' continues Laura Lee. 'Trails of wild ivy entwined in bowers of natural larch, either in a tall, floor-standing vase or sisal baskets along with pinecones to give an instant Christmas look to modern living areas. 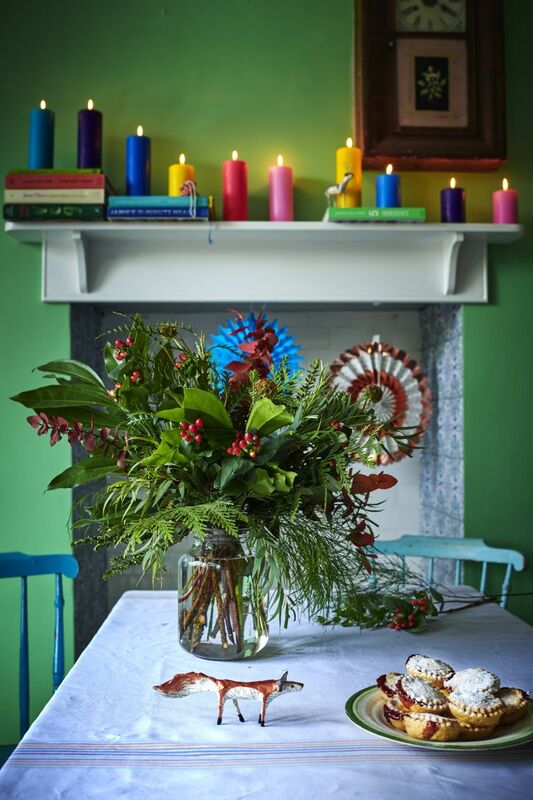 'An elegant Christmas display is easily achievable by keeping flowers, foliage and flora dark and mysterious. Birch twigs sprayed in deep plum colours and sprinkled with glitter will sparkle in candlelight. 'Place vases on windowsills with viburnum berries in them. They’re abundant in winter, just spray the berries with a touch of varnish for extra shine. One the table, use dark purple velvet ribbon, dark ivy or a mixture of both to tie napkins with a sprig of rosemary,' concludes Laura Lee.